I’m sure he won’t mind my saying, but MynoT has been around for a very long time. This week saw his twentieth Listener, with over a hundred elsewhere. I think I can say without fear of contradiction that his puzzles are on the concrete side of hard. His last Listener was Delightful Punishment back in November 2014 with its theme of overlapping letters. And this week, we had a grid without numbers and a list of clues in alphabetical order, also without numbers (thanks, editors). So it was jigsaw time, and that usually means a lot of cold solving. At least there were a lot of clues to get stuck into… 59 in total, with one unclued entry, all neatly scrunched into a 14×14 grid. There were also some extra letters in wordplay not entered in the grid, but they would have to wait until pretty near the end since they only made sense when put in normal clue order. Starting my scan through the clues, I was encouraged by how many I got. After 45 minutes, I had exactly half the entries solved. Even more encouragingly, that was over half of the clue answers since one of the entries was unclued. I decided to have another quick look through the clues and eight more were polished off in the next 45 minutes, including PIN-STRIPED and PANEGYRICS. It was time to try and cram some of these entries into the grid and see what happened. It seemed a good try to put those two P words at 1ac and 1dn. They were followed by NOUGATINE, ERRAND and YALE across, and NEURALGIA, TRANSFUSERS and PANNIER down. So far, so good, except TRANSFUSERS didn’t quite fit. Of course, the symmetry of the grid (didn’t I mention it was mirror symmetry about the SW–NE diagonal?) was a bit of a clue and made me cram the RS in the square forming part of the diagonal. After about an hour, the north-west half of the grid was nearly complete. As TÊTES-À-TÊTES went in, crossing FORERUNNERS, all became clear and SATURN was the first of the planets that this crossword revealed. After that, it was relatively plain sailing as I teased answers out of the last few clues. Put in normal clue order, the extra wordplay letters spelt out Symbolise clashes. I knew that the planets all had symbols associated with them, but I needed to google to find out exactly what they were. We were also told that these were to be resolved in a “modern scientific way”, which seemed to indicate astronomical, rather than astrological, symbols. I used the NASA web site since I was sure they’d get it right. And so another superb puzzle from MynoT was finished. Well, almost. I just needed to resolve the unclued entry, although this wasn’t needed for the solution. This was “connected with a thematic element and related to two others”. CRONUS (who would have been at 8dn if the grid had been numbered) was the son of Uranus and Gaia (Earth) as well as being the Roman name for Saturn. As for the title, well I’m not sure. I can only think that Stomach is an anagram of Satchmo, and one of Louis Armstrong’s most popular recordings was What a Wonderful World. Thanks, MynoT, you didn’t disappoint. Great fun. These are early days when the editors generally treat us to relatively ‘easy’ puzzles and MynoT had actually told me that he had a puzzle due and that it was fairly easy (but we all know that setters are good at judging the difficulty of other people’s puzzles but not very good at rating their own) so it was with some trepidation that we looked at this large grid, and with even more anxiety that I copied it into Crossword Compiler (such a useful solving tool!) and saw the astonishing unching and almost total lack of symmetry. What were the editors and MynoT treating us to? Did I say trepidation? It became sheer panic when we compared the word lengths with the spaces in the grid and found, for example, four eleven-letter words but not a single eleven-letter space in the grid, some eight-letter words, likewise with no place to enter them … and so on. Nothing to be done – except do a quick run through to make sure that MynoT retains his place as an honorary member of the Listener Oenophiles club, though, with good reason (we have shared a glass) I had little doubt. His seventh clue immediately confirmed his place: ‘Stall with coffee or tea (4)’ GAVE B[Y]RE + W, then with that BREW, MynoT ‘Drank back in warehouse (5)’ DEPOT reversed, giving us TOPED. The toping wasn’t over. Later we encountered ‘Grape skins etc that can be fermented without agitation, liable to wither (11)’ – one of those worrying eleven-letter words that, only with the endgame gave us a new word (for the Numpties who should have recognised the reference to MARC) MARCESCIBLE. MynoT hadn’t yet reached the end of the alcohol references. Next came ‘Foreign soldier to lubricate in bar (5)’ OIL in PU[B] giving POILU, and finally decanters: ‘America is engaged in conveyances for decanters (11 – another of those ‘over-long’ clues! )’ giving us US in TRANSFERS = TRANSFUSERS. Of course, at this stage we had no idea where we could fit that word. These clues were a fine set and we raced through them, with about three-quarters of them solved in our first hour but, oh dear, the head-scratching about how to fill our grid. There was just one faint hope, as, running out of highlighters and pens, we had, nevertheless, managed to colour code our word lengths and had noticed that there were five spaces for ten-letter words and four clues that would fit. Putting PINSTRIPED and PANEGYRICS into the top left corner, and ESSAYETTES and STRICTNESS into the opposite corner was our way into the grid fill and we quickly slotted in almost all the words we had already found, leaving an intriguing white strip diagonally up/down our grid from top right to bottom left. Now what? We could see elements of those extra long words in the grid that was appearing but there were, for example, extra letters like SAT in the centre of TETES-A-TETES and RUN in the middle of FORERUNNERS. ‘SATRUN’? AVENA and MUSE gave us VEN and US — Penny drop moment, ‘Venus’! Of course, from then on it was plain sailing – or almost. 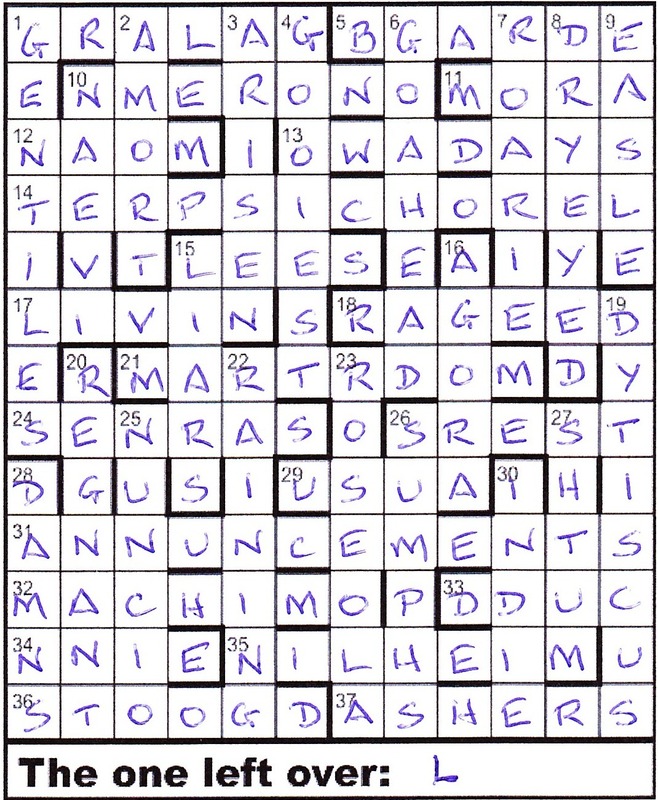 We still had to put those extra letters OYSSSAISECMLEHL into the clue order in which they appeared in the grid. What did we find? SYMBOLISE CLASHES. That was clearly telling us that instead of squeezing the letters of Mercury into that tiny cell, we had to enter the symbol for Mercury. Which symbol? One of the Numpties has done computing for the European Space Organisation and he announces that the symbols conventionally used in these ‘modern’ days are the age-old alchemical ones, so we are rather bemused by that requirement to ‘resolve certain anomalies (in a modern scientific way)’. We put the traditional symbols in with just a hint of anxiety. It would be a shame to be knocked out by the endgame of the second puzzle of the year if the editors have superior knowledge of some ‘modern scientific’ way of representing the planets. All in all, a lovely puzzle. Many thanks to MynoT for a most enjoyable solve. This week was the first puzzle of a brand new year. I sometimes reflect on what I was doing twelve months before to determine how quickly that year seems to have gone. This time in 2015, we were tackling Waterloo’s quirky Alcoholic Baseball Player. How long ago does that seem to you? For me, it seems some time, and at my age that’s somewhat satisfying. This was Kruger’s fourth Listener, his last being based on Margaret Thatcher’s quotation, “There is no such thing as society”. Here we had Letters Latent entries for the across clues, and extra wordplay letters for the downs. Both sets would match with the exception of an extra extra wordplay letter which would go under the grid. I worked my way though the clues in order. I failed with 1ac, although I wasn’t surprised since it was only in Collins. However, Humphrey B[O]GARDE went in at 5, as did 13 Currently, most prominent of Afghan dissidents are captured by ordinary means (7) [N]OWADAYS, once I’d worked out the wordplay (AD in O (ordinary) WAYS (means)). 14 Leaving academy, lithe corps are sick of dancing (12) was fairly straightforward as well, although deciding whether ‘sick’ or ‘dancing’ was the anagram indicator took a bit of time — it was sick (LITHE CORPS ARE – A)* giving TERPSICHORE[A]L.
I managed only a few more acrosses before tackling the downs, but a dozen of those soon had me on my way. Kruger was in one of his gentler moods with this puzzle, no doubt deliberately chosen by the editors to get the year off to a successful start — hopefully! There were only a couple of hurdles that got in my way. 10ac The most important Emperor hoarding money? Certainly not! (7, two words) looked for ages as though it should be NUMBER ONE before it transpired to be N[U]MERO [U]NO. And 9dn Family of wizards casting the final ashes of the Bard (5) needed a knowledge of Harry Potter to reveal EASLE ([W]EASLEY – last letter). (most common letter in ‘speedwells’). And most puzzling phrase of the week was in 11ac, as I wondered what ‘ethically indifferent alcohol’ could possibly be! Note to new solvers: ‘Nancy’ at 33ac refers to the city in France, not the character in Oliver Twist. It turned out that 1ac Texan’s bird, cockatoo, mostly returning to grains (6) GRA[Y]LAG was in Chambers by inference — the entry begins “grey or (esp N Am) gray” and this alternative can obviously (?) therefore apply to all examples of grey, including greylag. It didn’t take too long to suss the “thematically relevant phrase”: You win a few, you lose a few. Getting all those latent letters in order must have taken some doing. The extra wordplay letters from the downs gave all those with the exception of L which was slotted under the grid. A zippy solve this week, done and dusted in about 90 minutes, so thanks to Kruger for a gentle introduction to 2016. Here we are again – the start of another year of Listener puzzles and, with this being a leap year and our having one on the very first day of the year, we will be in for 53 struggles. I download with trepidation, even though I know that the editors tend to give us a couple of relatively gentle puzzles at the start of the year, possibly to encourage those contestants for the Radix trophy. Kruger! We are accustomed to some fairly complex puzzles by Kruger in the IQ series so we wonder. Of course, I know from those lively and stimulating pre-Listener Setters’ Dinner sessions in nearby hostelries that I don’t need to have any anxieties about Kruger’s continued right to a centre seat in the Tipply Listener Setters Fraternity/Sorority but I check anyway and he quickly confirms his membership: ‘Ends wasted from ethically different alcohol (4)’ gives us MO[W]RA. Not much further down even the ‘Sediment disappears (4)’ (Oh dear, Kruger – drinking the dregs!) giving us [F]LEES, then he moves onto Bourbon or something like that, ‘Drink acceptable in America (4)’ giving us USUA[L]. Cheers Kruger! By now, we are reassured. These are generous and gentle clues and our grid speedily fills. Almost as speedy is the deciphering of the message that is is appearing. YOU WIN A FEW, YOU LOSE A FEW. However, we have to carefully complete our grid spotting those extra letters in the word play in order to work out what the one Left over is going to be. Could that be a cryptic hint? We enjoyed our first Listener crossword of the year. Thank you, Kruger. Our initial reaction on downloading Horvendile’s ‘Present Day’ was a delighted ‘Well, that’s a big grid, it will keep us busy for the rest of Christmas Day – Present Day – that’s today. It must be about Christmas boxes. What fun!’ Then realization dawned. That odious word ‘Playfair’ appeared, and not just that. ‘Every entry is Playfair-encoded using the code-square that must be completed in the centre of the grid.’ Oh well, I imagine the ‘four unclued entries’ will give us a hint about the keyword. But no, it gets worse, as they are considered ‘entries’ so clearly are to be encoded too. How on earth are we to find the keyword? Nothing to be done! Call this a crossword? We can’t cross any words and simply have to cold solve – and we cold solve and cold solve and … until almost midnight when we have solutions to forty-five of the fifty-six clues. Now come on, Numpty, you are being rather tough on poor Horvendile; some of these were super clues and what sort of mind can calculate how the enciphered clues are going to intersect to create a working grid. I just can’t imagine how he/she (well, there are two or three women amongst the setters) managed this feat and hope she/he will give us a setter’s blog. For example, we smiled at ‘Work with great singer, one barely seen up (6)’ (GO + DIVA – well, she was naked up on a horse wasn’t she?) ‘Wanton cop abroad touring Romania (6)’ (That’s our French FLIC round RO, having a FROLIC) and ‘Cheese is dear around mid-January in Paris (6)’ (more local fare for us CHERE round (jan)V(ier) giving CHEVRE). Of course we ‘cheat’ if using Braingle or Quinapalus is cheating and I truly admire anyone who solved this crossword without an Internet tool. Poor Mr Green, who not only has to mark the grids that come to him with just two normal words at the start of those Playfair squares, but also solves and functions without the help of the Internet. I stay up well after midnight fiddling with potential ways into this crossword. We have already produced some data, several letters that have to be related. For example, I and P must appear in the same row (first); E and H must appear in the same row (could be the second but probably the third); O and R must be in the same column – and so on. But are we going to have to make these calculations for the entire Playfair square in order to find that key word? WAMPUS is a help since that W cannot encipher to itself, and we make the guess that the WY of WYCH will become the YZ of our Playfair square so that, putatively, we will have (U)VWYZ at the end of our square and X in our keyword. I refuse to admit to how much time I wasted on XMASTIDE and other X words. We had WHIP at 23ac but no Internet tool, when I brainlessly fed in my IP enciphering to XM, and WY to YZ would give me any X words in the suggested keywords (or any suggestions at all). However, the list provided by that last couple included PACKING BOX and when I paired IP with PA, that seemed to work and seemed appropriate – and, of course, P in that cell, led to I at the end of the row. Of course, after we had used that keyword for a while, it failed, as sections of intersecting words didn’t agree. Back to the head-scratching. But ‘PACKING BOXES’ was provided and Eureka, that worked! Later, a friend who made far less of a lucky leap (Internet aided) than I did, explained his logic – how, using those calculations of the placing of pairs of letters, he constructed the basis of his square. I include it here. Next morning, we laboriously completed our enciphered grid, which, of course, allowed us to decipher the letters of the clues that were still unsolved (KENSINGTON, S’BLOOD, VULNED, FINSKO, DAFTAR; seriously! How will my friends react when I produce those in conversation this week?) and we were left with four glaring spaces where we had to put thematic words. ? ?ST, ??NI???? SH? ?, and ????ND?? Four ‘PACKING BOXES’? Oh how grateful I am for TEA. I simply fed those, individually into TEA and chose the most likely words from the many offered and enciphered them. No CONIFERS didn’t work (no Christmas cheer), but CANISTER did encode to KCXPHMFL, which fitted the encoded pairs and single letters already in place. In the same way, we found (with Mrs Bradford’s help) SOLANDER encoding to FGMPBEFL, and KIST and SHOE. I grumbled at first that SHOE was an adjective and the others were nounal, but no, Chambers tells me a SHOE is a sort of box for cards. My clever friend was far more technical and I append his method. This was tough, tough, tough. 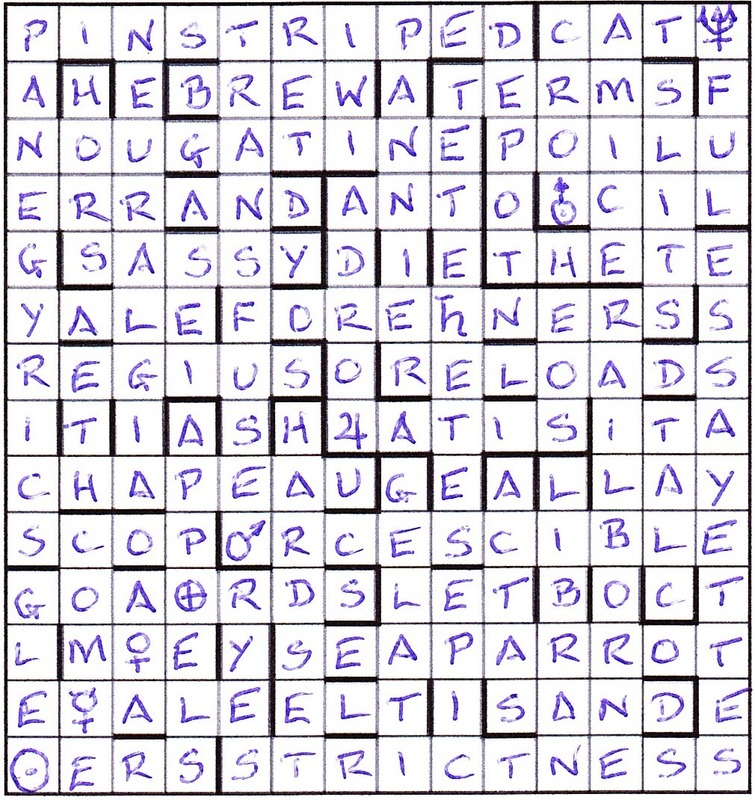 Had we not managed to complete all this year’s Listener crosswords (whether correctly or not I do not know; it is too distressing to check and find an error as early as January so once they are in the mailbox, we forget them) I think we would have abandoned at the start. And to think that I complained about Sabre’s Knights’ moves, you can come back, Sabre, all is forgiven! But seriously, congratulations Horvendile. If this really is a début and you are not Mash, Quinapalus or Sabre in disguise (and I did decipher Horvendile but it gave only fx ly je hc js) then it was a most impressive one.